Arizona - home to desert cactus, the O.K. Corral, the Grand Canyon….and lots (and lots) of air-conditioning. It's the 48th state, having been admitted to the Union in 1912. Prior to settling on "Arizona," some of the names considered ranged from "Gadsonia" to "Arizuma." Arizona is a leader in copper production. In fact, the roof of the capitol building is made from the equivalent of almost five million pennies. The state was also the site where famous Native American heroes Geronimo and Cochise led revolts on behalf of their people. Famous Arizonans include singers Stevie Nicks and Linda Ronstadt, labor leader Cesar Chavez, and Olympic gymnast Kerri Strug. Ready to make a deeper dive into the Grand Canyon State? Here's our list of 20 of the coolest things to check out. Just outside of Sedona is this popular park. Locals know to go in the spring, when it's much less crowded. The fun of the natural water slide is offset by some truly gorgeous mountain scenery. And there are some small cliffs to jump from - right into icy cool waters. For decades, this lovely Japanese festival has welcomed spring to the state, with a celebration of culture, art, food and more. Kick back in the sake garden and relax. As the desert awakens, one of the best ways to see it is via a Jeep tour. 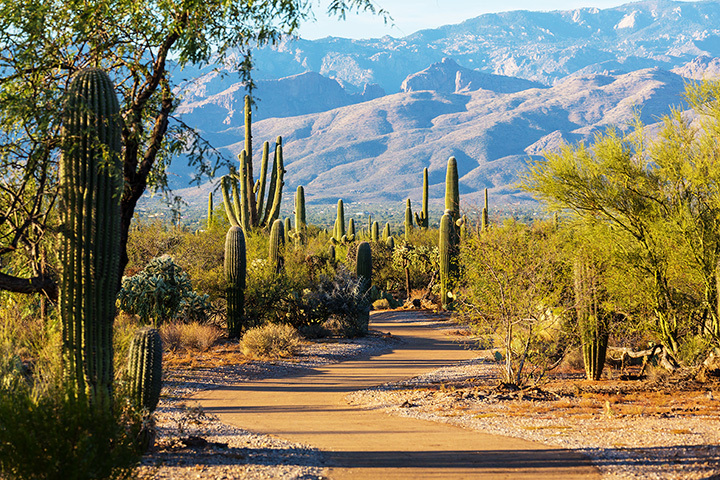 Numerous cities in Arizona offer this rugged way to sight-see. The rare, giant saguaro cacti are emblematic of the West, but grow in only a few places. This location is one of them. When you visit this park during the spring, you'll be treated to a pretty spectacular display of blooms. It's a magnificent sandstone formation located on the slopes of the Coyote Buttes. The undulating layers attract photographers and hikers alike (you need a permit to be there), but the effort is well worth it. Even on a hot Arizona day, this mile-long cave outside of Flagstaff stays around 42 degrees - and ice has even spotted inside. Formed about 700,000 years ago, it makes for interesting exploration, as you clamber over the ancient lava bumps. This shaded swimming hole, located inside Oak Creek Canyon in the Sedona area, is a great place to escape the summer heat. There's also some pretty hiking in the area. This tiny ghost town has a permanent population of just six people, but hundreds more flock here for the great food at the Superstition Saloon and Restaurant (where real saddles fill in for bar stools). You'll also want to sample some Prickly Pear ice cream at the country store, or shop for souvenirs at the gift shop. The 30-second shootout between the Earps and the Clanton-McLaury gang is one of the iconic events of the Old West. It comes to life daily in Tombstone; once the shooting stops, have a look around the historic buildings in the "Town Too Tough to Die." Since opening in 1929, it's become the home to one of the most prestigious collections of Native American art anywhere in the world. Spend an afternoon exploring. Most of this fantastic museum is located outside, giving a truly unique view of the plants, animals and more that inhabit it. There's a cave to mine your own fossils, a birds-of-prey demonstration and so many more things that give you an amazing look at the desert. Since 1901, this has been a fun, relaxing way to see many parts of the Grand Canyon (and you bypass the annoying drive). The train staff provide lots of information and "color commentary" about this glorious natural wonder. The spectacular views have made it a favorite location for various movie shoots. Sunset is a favorite time to be there, as the colors change among the massive rock formations, buttes and sand dunes. Be advised, this is a sacred site for the Navajo tribe, so please don't touch or take anything out of the park. It's one of the great engineering feats of our time, holding back massive Lake Mead and producing electricity for the areas around Arizona and Nevada. It towers at 726 feet high, and runs 1,244 feet long. Everyone who sees this marvel deems it awe-inspiring. Located within the Grand Canyon, the startling blue-green waters at the base of the almost-100-foot drop attract those who want to take a dip, or just sit on the shores with a nice picnic. The falls are located on tribal lands, so please be respectful. It's a draw for metaphysical types looking to tap into its unique "energy" (the many stores selling crystals and psychic readings are proof of that). But even if you're not into that, the red rocks surrounding the town are magical in their own way. Some have deemed Sedona one of the most beautiful places on earth. It looks like a high-rise - but it's one of the best-preserved ancient cliff dwellings in the world. Dating back to the 12th century, there are five stories, 20 rooms and an amazing museum with incredible artifacts including stone tools, bone needles and more. Established in 1916, this is one of the best places in the state to pick up authentic Native American crafts and products. Plus, they have a pretty sweet restaurant on site, serving up delicious fare like "Navajo Tacos." In the summer, hiking "the Supes" (just outside of Phoenix) is way too hard. Winter is another story. You can opt for an easy day-hike or one that requires more stamina. Either way, you'll get some amazing views. Prescott is known as the state's holiday destination. There's a great parade, tree lighting and many more festive events. And even though it's Arizona, the city averages a few inches of snow each month from December through February, so you can get that White Christmas vibe going.